Home › Crypto Review › Bitcoin is enjoying a rare rally. Where’s the catch? This week will be remembered by the crypto market participants with the revival of increased dynamics. The total capitalization of all cryptocurrencies increased from April 2 by 18%, reaching $174 billion. The bitcoin price spiked from levels just above $4,200 to $5,300. Daily BTC trading volumes reached a record $23 billion on April 4. Such substantial trading volumes of the benchmark cryptocurrency were reached only in early January 2018, when the first phases of the large-scale crypto market correction took place. The Bitcoin pulled up the entire altcoin market, where the Bitcoin Cash (BCH) became the absolute leader, jumping 102% to a peak of $340, and the daily trading volume jumped by 950%. 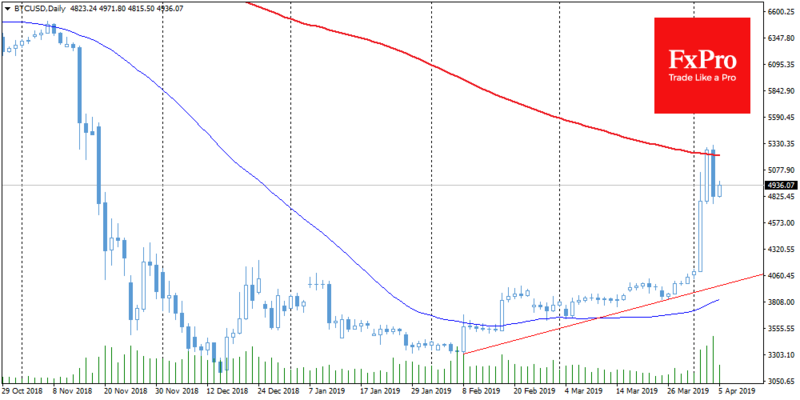 The Litecoin (LTC) at the best moment added up to 60% to $96 with the growth of trading volumes by almost 260%. 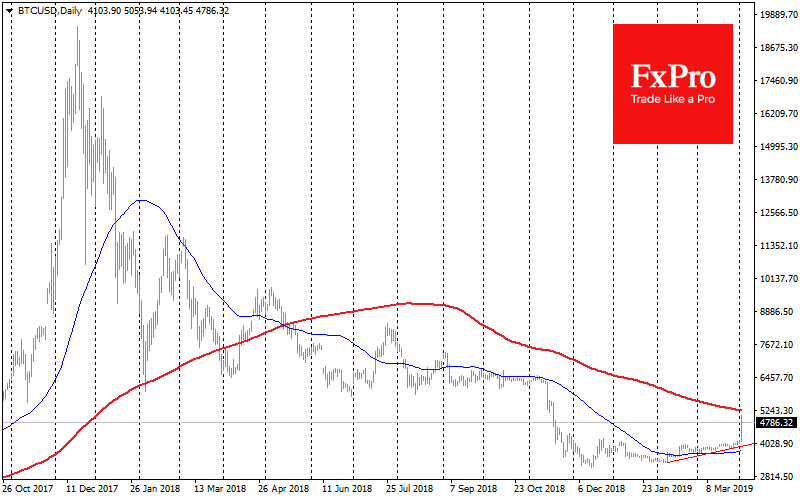 As for the technical analysis, it is necessary to note the importance of the $5300 level for Bitcoin. 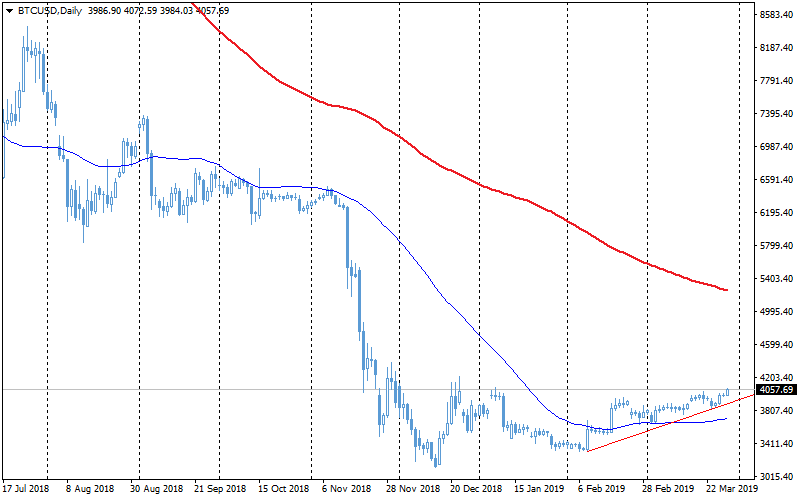 Through this level passes the 200-day moving average, to which financial markets are paying increased attention. It is a kind of health indicator for large investors. The prices above this level indicate the predominance of purchases by the instrument. The bulls were unable to immediately send the Bitcoin price above this important level, and this triggered a wave of profit taking and decline of BTCUSD to $4,800. 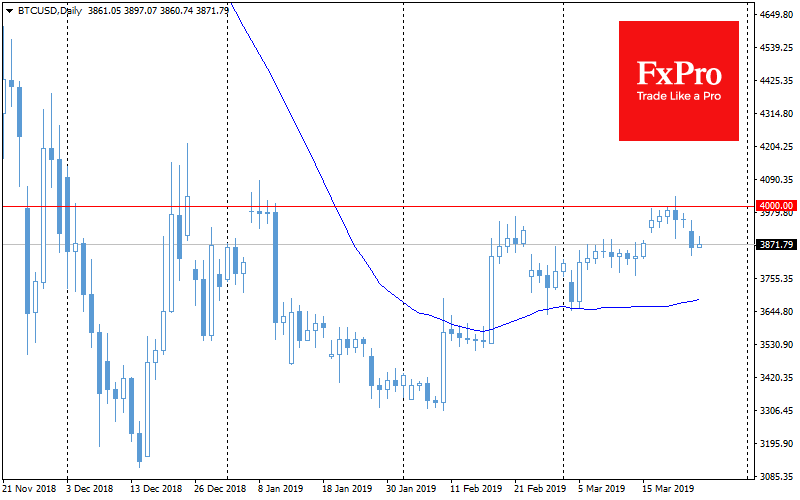 Technical analysis indicates that growth above $5,300 can open the way to $6,200, that is, to fully offset the November decline. Increased trading volumes and the interest of market participants suggest a predominance of bullish sentiments. At least, in the short term. At the moment, we managed to find out that the reason behind rally could be a large order for the purchase of about 20,000 BTC dispersed among three large exchanges, which caused the automatic activation of a large number of buy orders, plus a wave of stop orders for $500 million in short positions. The lack of fundamental growth factors and a clearly positive news background is somewhat alarming for market participants. 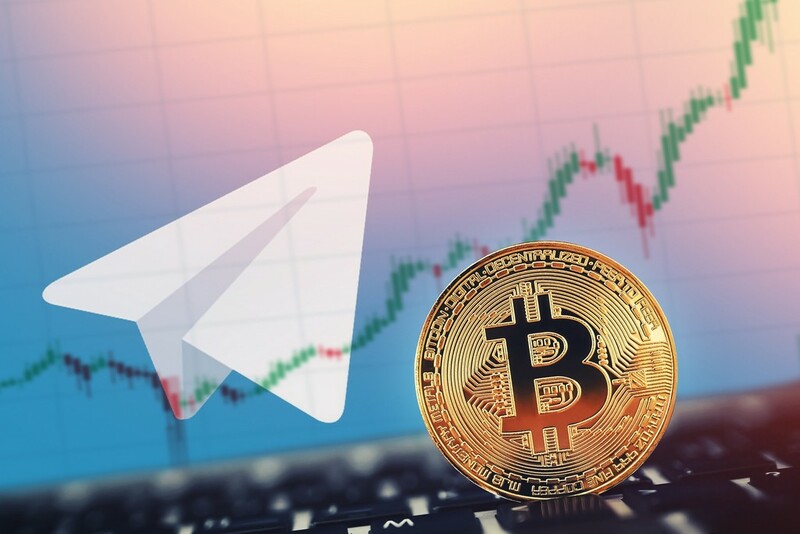 The analytical company Flipside Crypto data showed that 2 weeks before the rally, the volume of activity on BTC-wallets markedly increased, which also influenced the increased momentum. Nevertheless, according to the data from the largest wallets list, on April 2, the cold wallet owned by Binance “slimmed down” by more than 21,000 BTC. In the future, the causes and consequences of the current dynamics will be disassembled more detailed, but at the moment conclusion suggests itself about the new market manipulations, which can be quite short.